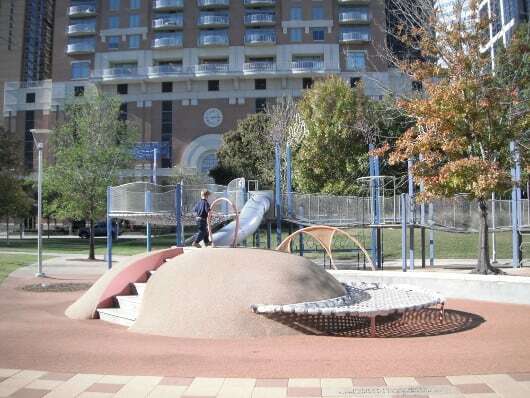 John P. McGovern Playground is located in Discovery Green in Downtown Houston. It is about 5 blocks from the Main Street Square METRORail Station and has paid parking lots and metered street parking. Street parking is free on Sundays and after 6:00pm everyday. 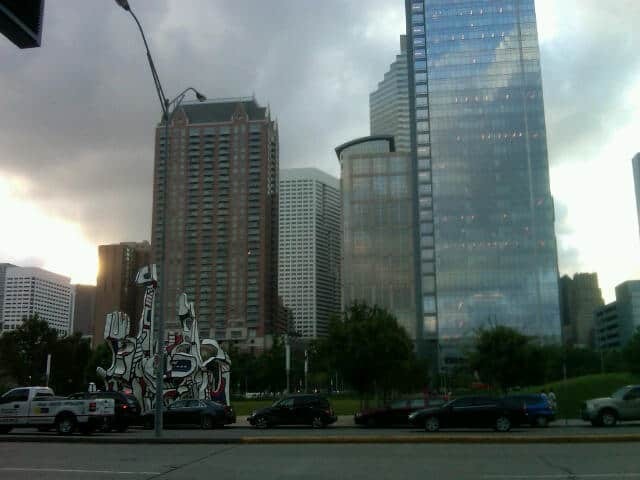 Discovery Green is one of our favorite spots in Houston. There are almost daily events in the park and most of them are free. There is also a lake, restaurant, splashpad, listening vessel, playground and much more. It’s hard to believe this space was a parking lot not too many years ago. 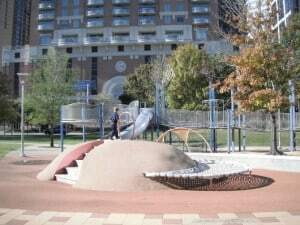 The playground area is on a soft rubber mat and has many things for the kids to climb. 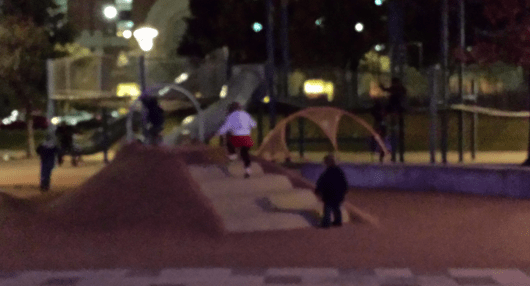 It is slightly below street level, so kids do not dart into traffic. Since I first reviewed the playground a couple of years ago, several improvements have been made. The big play structure has a unique net that is sort of like a trampoline, but not super bouncy. My kids love this, but it is a bit too wild when the park is busy. Especially for my 2 year old. 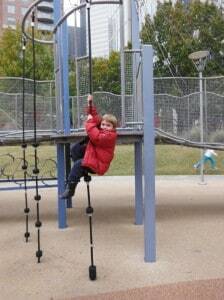 My kids also love the climbing ropes and the zip lines. It is really a neat play area. And pretty too. 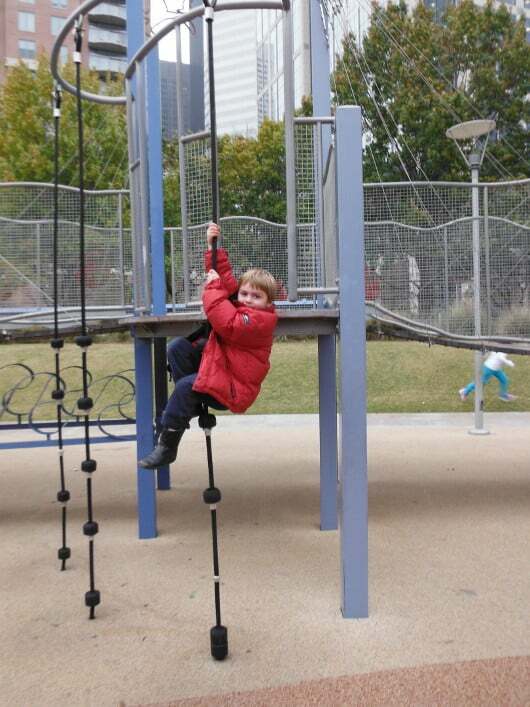 The theme of the playground is the major migratory flyway for birds that pass over Houston. There are birds cut outs above the structure. Discovery Green has restrooms right next to the playground and they have been open every time we have visited (morning, afternoon and evening). The playground is not fenced in, so much like the playground at Hermann Park, it takes some effort to watch the kids. Especially when it is busy. My kids love this playground but it is best when it is not a nice weekend and everyone is at the park. It’s really too difficult for me to chase my 2 year old and watch my 4 and 6 year old when tons of kids are playing. But, this is really no big deal. If the playground is busy, my kids are happy to go run in the grass, roll down the hills or explore other parts of the park! Lunch Box Idea: Greek! Pita, Hummus & Stuffed Grape Leaves!